Hello Guys. How is your preparation Going? If you are really serious about SSC CGL Tier-1 Exam, you must strengthen at least Mathematics and English because they are the key subjects. 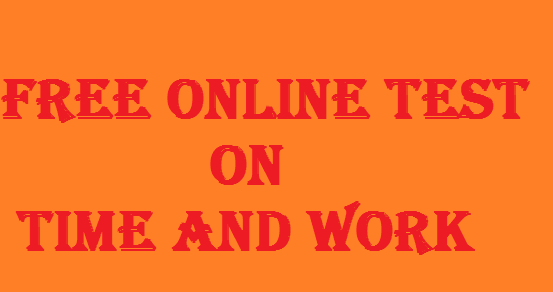 Today, I am providing you a Free Online Test on Time and Work for SSC CGL Tier-1 Exam. All questions in this test are either already asked in Tier-1 Exam or can be asked in upcoming exam. This test has 15 questions each having a weight-age of 1 marks like original Tier-1 Exam. On each incorrect answers, you will lose 0.25 marks. If you are good in Time and Work Section, it's a must try test for you. Participate in this Free Online Test and leave a comment using the below given comment box. I will keep adding more Free online Tests on different subjects so stay tuned.